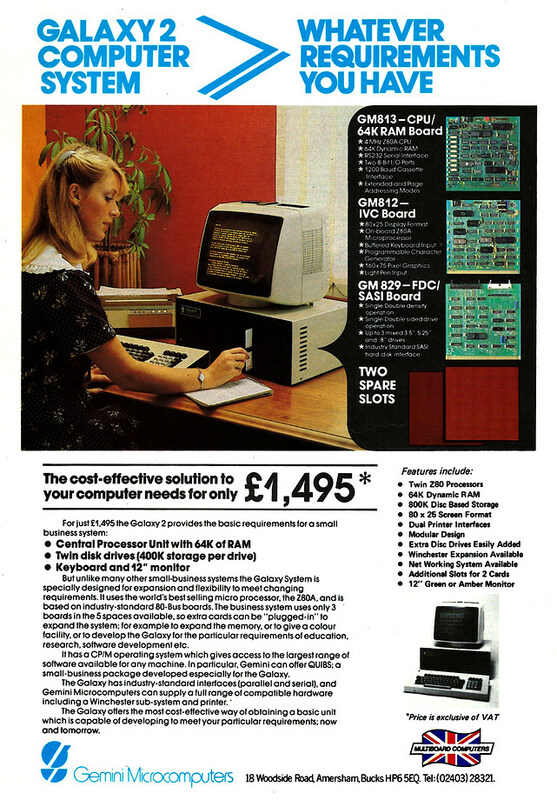 This advert for the British-made Galaxy 2, from Gemini Microcomputers of Amersham, Buckinghamshire, seemed to have been around for ever - in fact the spec of twin Z80A processors with twin 400K 5.25" floppies running CP/M on an 80-Bus motherboard (with two free slots) wasn't that disimilar to machines several years older than it. Nor was it that disimilar to the Galaxy 1, which had come out the previous year and which was based on Gemini's even-earlier multiboard system. It did, however, offer the software package "QUIBS", which was developed especially for the Galaxy. The Galaxy 2 retailed for £1,720 - about £5,780 in 2019 money. The "SASI" mentioned in the advert had been developed by the famous Shugart disk company in 1979. It was the forerunner of SCSI - an interface popular with "more serious" micros.